Even if European countries closed their borders to migrants and refugees, the percentage of Muslims on the continent would continue to rise over the next three decades, according to a report released Wednesday by the Washington-based Pew Research Center. According to Pew’s data, Muslims made up 4.9 percent of Europe’s population in 2016, with an estimated 25.8 million people across 30 countries, up from 3.8 percent, or 19.5 million people, in 2010. The number of Muslim migrants arriving in Europe surged after 2014 to almost a half-million annually, largely the result of people fleeing conflicts in Syria, Iraq and Afghanistan. The countries covered in the study included the 28 European Union members, plus Norway and Switzerland. 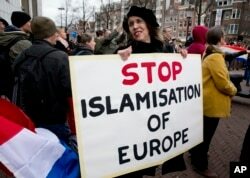 FILE - A woman holds a placard at a rally calling against immigration and what demonstrators see as the Islamization of their communities, in Amsterdam, Netherlands, Feb. 6, 2016. The report considered three scenarios: zero migration between 2016 and 2050; medium migration, in which the flow of refugees stops but people continue to migrate for other reasons; and high migration, in which the record flow of migrants between 2014 and 2016 continues indefinitely with the same religious composition. Under the first scenario, the population would continue to grow because Muslims are, on average, 13 years younger than other Europeans and also have a higher birthrate. The study projected Muslims could make up 7.4 percent of the European population by 2050, even with zero migration. Under the medium migration scenario, Muslims could account for 11.2 percent of Europe’s population by 2050. While under the high migration, the record flow of migrants who came to Europe between 2014 and 2016 would continue indefinitely, resulting in 75 million Muslims in Europe, or about 14 percent of the population by the middle of the century. But even the scenario with the largest growth leaves the Muslim population considerably smaller than the populations of both Christians and people with no religion in Europe, according to the report. Muslim immigrants have been a politically sensitive topic in Europe following the influx of newcomers between 2014 and 2016. Some countries have seen backlashes that have included populist parties campaigning on anti-Islamic messages.